“The key idea, the central core of all the quantum paradoxes, is that possibilities-universes conspire. So you think you have “boundary issues”? We have been challenged to overcome provinciality and learn to think regionally, nationally and globally. Global thinking is still a challenge. Now the siren call of Mystery invites us to explode our cosmic boundaries. The limits of our observable universe (14 billion light-years and roughly 100 billion galaxies) have erupted out the top end and penetrated the infinitely small. Our universe may be even older, but time as we know it did not exist, nor can we see through the Big Bang to gauge it. How can it be a “uni-verse” if ours is only one of many? Universe used to mean “All that there is.” That attribution has been co-opted by the term multiverse, although technically there can be many multiverses. We are reluctant to believe that parallel universes are a true description of nature. Still, we (along with our myriad of virtual clones and alters) are invited to embrace this wider canvas, this grander vision. Our vision of the multiverse is more vast than even a few years ago as there is evidence for many possible forms a universe can take. There is a greater collective, more than one universe embedded in higher dimensional space or hyperspace. Our worldview must change to a multiverse view, even though it may be difficult to wrap our minds around the notion. The multiverse is the set of all possible universes throughout time, including our observable universe. Physicists say the multiverse resembles boiling water with bubbles that form and rapidly expand. At both ends of this open-ended spectrum, we can infer what we may not observe. We have found other worlds looking both ways, through the lenses of cosmology and quantum physics. Observations demand we change our worldview to include these parallel universes. Whether we look above or below, we see our universe with its 100 billion galaxies embedded in an even larger reality - the multiverse, with separate closed volumes of space and time. Infinite space far exceeds the limits of our observable universe. Webs of parallel universes are equally possible. We can image them like balloons connected to one another by rubbery necks of spacetime - wormholes. The regions inside and outside the balloons and wormholes are outside spacetime. They don’t exist. In shows like Twilight Zone, Star Trek, Quantum Leap, and Sliders the heroes traverse wormholes and black holes, travel through time, enter alternate dimensions, battle their own alter egos, or mysteriously begin living different life stories. Many of our common ideas about the nature of parallel universes come from these well-worn sci-fi themes. We get the idea we might be able to detect them, share information with them, interact with them, even pop in and out of them. Most people embrace a single simple notion of parallel universes, if any. But there is no convergence of alternate views of parallel universes. As you read this you could be splitting into a virtual infinity of alternatives, unseen worlds each unaware of the others. In most theories, you are unlikely to see your other selves, even if you can imagine their existence. Physics calls this their “non-fungible” nature, which means they cannot be viewed or experienced. But don’t worry about comprehending this; it has nothing to do with fungi although many-worlds seem to sprout like mushrooms. Perhaps in some parallel universe, you’ve already gotten it. If you find the notion of an endless progression of universes sprouting from one another hosting an infinity of unconscious doppelgangers unsettling and hard to fathom, you are not alone. Even physicists who embrace the concept find the idea deeply disturbing. Most researchers now believe the many worlds hypothesis is an accurate view of reality, backed by well-tested theories such as relativity and quantum mechanics. It makes our paradigm of the observable universe obsolete, even though only a century ago we couldn’t see out of the Milky Way or into the atom. There is not just one theory of parallel universes, but a variety of them ranging from bubble universes, accelerating universes, expanding universes to branching universes. We are confronted with self-reproducing universes, mini-universes, chaotic universes, alternative universes, quantum universes. The fabric of our universe is flat, as shown by the acceleration of space (Goldsmith). Nearly every luminary in the field, from cosmologists to theoretical physicists, seems to suggest a different variant. That is hardly surprising since there are also a variety of theories about the fundamental nature of the known universe. Different theories account for different assumptions and observations, make different predictions, and lead to different conceptual and mathematical models. For example, Princeton’s Paul Steinhardt argues for the “ekpyrotic model,” an extension of string theory called M-theory. In M-theory fundamental objects are two-dimensional membranes living in eleven-dimensional space-time. It can contain objects of five-dimensions. In M-theory our universe and others result from collisions between membranes in this 11-dimensional space. Unlike the universes in the “quantum multiverse”, these universes can have completely different laws of physics - anything is possible; all potentials can be realized. Before the Big Bang our universe consisted of two perfectly flat four-dimensional surfaces. One of these sheets is our universe; the other is a parallel universe. Random fluctuations in this unseen companion universe caused it to distort and reach toward our universe. The energy of the collision was transferred into the matter and energy of the Big Bang. In superstring theory there are 10 dimensions, but most of them are thought to be tightly curled up. Now scientists say the extra dimensions aren’t as small as they originally thought. One or more of the extra dimensions could be perhaps a millimeter across. If so, our visible universe is one of “parallel universes” crammed into this unseen space. It looks big in three dimensions, but could be tiny in other dimensions. We can’t travel between them, since the matter and energy of our universe are confined to our standard three dimensions. But, many big universes could fit in such a small area, like sheets of paper stack together. Another theory, “quantum cosmology” seeks to marry the irreconcilable theories of relativity with quantum mechanics, which it claims applies to the entire universe at all times and to everything in it. There is no fundamental difference between observer and observed. The wave function of the entire universe can’t collapse each time an observation is made. In cosmology there is only one system that is measured only once. In quantum cosmology, the universe appears from quantum fuzz, tunneling into existence and then evolving classically. Both the no boundary and tunneling proposals predict the conditions necessary for inflation. Together parallel universe theories constitute a virtually unbridled proliferation of universes, dimensions, membranes, superpositions, timewarps, Hilbert and hyperspaces. Splitting and merging, some are near; others impossibly far off. Some are similar to our local universe, others quite bizarre. Is that of your alter egos and some of these worlds with our duplicates are far off in our local universe. Since cosmic expansion is accelerating you will never see your alter ego. Almost all universes of the Level I multiverse are empty and dead. Even with the same laws of physics, different initial conditions yield different results. All histories not forbidden by conservation laws are virtually mandatory - they will occur in unquestionably real regions. Imagine our lives have an infinite number of alternative scripts. If we try to see what’s going on, everything changes to complementary possibilities. Is that of Andre Linde’s and astrophysicist Trinh Xuan Thuan’s self-reproducing bubble universes, breeding more and more inflationary universes, which we cannot contact. There is a rich froth of bubble universes infinite in space and time. Space as a whole is stretching forever, but some regions stop and form discrete bubbles. In this infinite set of Level I multiverses there are different particles, physical constants and spacetime dimensionality perhaps due to different symmetry breaking. In Steinhardt’s M-theory model the multiverse is produced by the cycle of birth and destruction of universes, reminiscent of the Hindu myth of Vishnu dreaming up an eternal chain of Brahmas, each an innumerable creator of a universe. Lee Smolin suggests another multiverse that mutates and sprouts new universes through black holes rather than through brane physics. Our universe is a calm bubble in an infinitely large, chaotic eternally-inflating multiverse. Linde likens the universe to a growing fractal, sprouting self-reproducing inflationary domains which spread and cool into other universes. Bubbles are created from the quantum foam of a “parent universe.” Bubbles may also originate from false vacuums, which decay producing new “bubble” universes at an accelerating rate on an infinite tree of bubbles. Our universe is a typical branch on the tree in a real wider space. Is the many worlds of Everett’s interpretation of quantum mechanics. Tegmark says this multiverse level adds nothing new to I and II except more indistinguishable copies of the same universes. Tegmark assigns this level to the superposition of classical worlds, located “elsewhere,” embodying different ways events could have unfolded. The same stories play again and again in unreachable quantum branches. Each story line we follow meaningfully connects a single future event to a past event. We can’t predict the future because we become aware only of the story line with the greatest probability. MWI is a two-way street: not only do we exist in more than one world, every event in the universe affects us. Everett never explained why we are stuck on just one branch. When we see things with a fresh eye, we enter a parallel universe, reinventing ourselves. Only our viewpoint changes but new meaning emerges. Intimately involved with our histories, countless parallel universes accommodate all the possibilities that quantum physics contains. Containing all possibilities, these universes are static, so change and time are illusions. The paradox of Schrodinger’s Cat is used to illustrate this interpretation. When an observation is made, new universes are created from among all possible outcomes. When two parts of the universe interact, all possible results (superpositions) become real. Our copies remain unaware and uncontactable in worlds of their own. Only one reality lasts long enough for us to notice. We switch realities with every passing moment as our wave function is repeatedly split due to interaction with quantum systems, but all we notice is slight randomization, uncertainty. Is that of pure mathematical structures, a sort of Platonic paradigm of ideal forms but based on different laws of physics and altogether different equations. Mathematical structures, such as a dodecahedron, are abstract, immutable entities existing outside of space and time. Every mathematical structure is a parallel universe, according to Tegmark. But, “the elements of this multiverse do not reside in the same space but exist outside of space and time.” This is the realm of abstract geometries, manifolds, vector spaces, tensor spaces and other equations. In Level IV, entities aware enough can subjectively perceive themselves as existing in a physicaly “real” world, according to Tegmark. Plato thought mathematical forms were the true reality, but that we perceive reality imperfectly as in his allegory of the shadows on the wall of a cave. His notion was a top-down theory. We may or may not eventually find a mathematical structure to match our own universe. Instead we may find the limits of the effectiveness of mathematics. Rudy Rucker also claims this mindscape exists as a physical reality. Like Plato, he believes in a world of ideas separate from the mental and physical. Consciousness can explore this realm of all possible thoughts just like the body explores the universe. We all share the same mindscape just as we share the same universe. Our virtual duplicates are like our everyday universe, occupying a region of spacetime, containing conventional and exotic matter, galaxies, stars and perhaps life. Only some parallel universes foster the emergence of life. “It is uncontroversial that, of all the environments that exist and have ever existed, only a tiny proportion are suitable for life to evolve. However, there are vastly more in which life can survive once, for whatever reason, it is present there. Some theories of parallel universes emerge from cosmology, others from quantum mechanics. All of them represent attempts to model our universe accurately with the known laws of physics. The trouble is, our knowledge of nature’s laws is incomplete, and our theories of Cosmos suffer from our blind spots. We don’t know the conditions or constraints for the generation of universes. Nature isn’t confined to the limitations of our perceptions. Our theoretical models are incomplete. Stretching the boundaries of empirical knowledge, recent findings have forced the idea of multiple universes on scientists. Physicists have inferred that many worlds exist, some with potentially different physical conditions, laws, and matter. Their existence, implied by cosmological observations, solves some difficult paradoxes in quantum physics and cosmology. To deny them complicates physics even more. Parallel universes might be utterly unlike our own, having different particles (such as mirror matter or dark matter) and forces. Perhaps they are confined to membranes with fewer or more dimensions. They may have identical properties to our own universe, yet be folded to appear very distant. Dark matter could be composed of ordinary matter, even ordinary stars and galaxies, shining brightly on their own fold, yet emitting no apparent light in our universe. In Buddhism, the universe is perceived as timeless, eternal with no beginning or end. It is rooted in the Void. In Vedic cosmology, ours is one of countless universes clustered together like foam on the surface of the Causal Ocean. An enveloping shell of subtle primeval elements separates each. In the Judeo-Christian vision the universe begins with Light. Some modern theories mirror these metaphors, but multiverses are more than metaphorical. In the beginning was nothing but hyperspace with fluctuations in nothing. Bubbles emerged and began expanding rapidly, producing our universe. Shall we imagine chains of universes, bubbles within bubbles, endless proliferations of universes reiterating in fractals? Do baby universes sprout from black holes or are there isolated island universes in other dimensions? We can take the top-down view of cosmology and superspace. Superspace is John Wheeler’s original name for what is now called quantum foam. It consists of pure massless charge flux, pure scalar waves. Or, we can take the bottom-up view of the infinitely small quantum worlds, or string-theory. Are these meta-universes divergent or aligned with our own? Are they close at hand or far, far away? Are there more multiverses as time goes by? Alan Guth of MIT created the inflationary theory of ever-expanding universes. As the visible universe expands, it gives birth to new universes. The multiverse already has an infinite history, far exceeding that of our local universe, which is around 14 billion years old. Everything that can happen does, somewhere in dimensions we will probably never fathom. In the many worlds interpretation of quantum mechanics, all possibilities exist and simply are. Life only exists in a small subset of the sets of universes. Not every embryonic universe forms hydrogen or carbon essential for molecular biology, life as we know it. Hugh Everett III first proposed his many worlds theory in the 1950s to overcome the need for an observer to collapse the wave function of the Copenhagen interpretation. The wave function rotates in an abstract infinite-dimensional space called Hilbert space. Collapse is a change in our knowledge of the system through measurement, and interaction of observer and observed. The wave function is a quantity that encodes the probabilistic information about such variables as position, momentum and energy. In Everett’s theory (the “relative state” formulation), the universe is one holistic wave function. There is no collapse from possible to actual, just a set of amplitudes in which all possibilities throughout spacetime remain as superpositions. Each world splits into equally real multiple possibilities after each and every event. Our doppelgangers live on other quantum branches in infinite Hilbert space. All possibilities are physically real in their own dimension, though virtual entities to an observer in another dimension. Ordinary existence, from possible to actual, arises from quantum decoherence. Decoherence mimics wave function collapse, but preserves unity. Decoherence is the term for disappearance of the multiple additional possibilities. Interaction of object and environment destroys certain states faster than others. Vacuum fluctuations generate superpositions of all possible initial conditions. They coexist simultaneously, but decoherence causes them to behave classically viewed within separate quantum branches. David Deutsch, who developed quantum computing, is the most prominent supporter of Everett’s many worlds interpretation (MWI). Quantum computers theoretically use atoms from parallel universes for their calculations. Deutsch says that different times are the same as different universes. The many-worlds branch toward the future creating an apparent arrow of time. In the branching tree of alternative histories, the outcome of one branching profoundly affects probabilities of subsequent branching, and even the nature of alternatives subsequently available. Different possible histories each have their own probability according to Murray Gell-Mann. In Andrew Gray’s History Selection formulation of MWI, history is selected over all space and time. Particles “decide” which equi-probable branches to take by choosing the least destructive path avoiding interference with another particle at some stage in the future. The particle seems to “know” what will happen if it goes one way or another, and chooses the highest “survival” potential. It somehow seems to perceive the whole of its space-time world line with its actions now influenced by what can happen in the future. They somehow avoid interference in a non-causal way by selecting from all probabilities. We cannot control the fates of our other selves in the multiverse. But if someone dies, they can still be alive in another universe. This suggests intriguing questions about free will, reincarnation, immortality, and perhaps the supernatural. Shall we take comfort that there are some worlds where we don’t make our worst mistakes, where we don’t lose our loved ones or die prematurely? Our universe could be just one of a manifold of all possible universes. Perhaps the universe tunneled from nothing. Quantum tunneling allows objects to pass through barriers that are impassable according to Newton’s classical laws of physics. In 1962 John Wheeler discovered the Einstein-Rosen bridge, later known as wormholes. Sidney Coleman, theoretical physicist from Harvard, investigates the nature of the vacuum and its relation to the cosmological constant. Wormholes are tube-like regions of space that connect one region of the universe to another. Wormholes may contribute information to our universe in the form of values for the constants of nature, or fix the energy density of the vacuum - the cosmological constant. Dark matter, the invisible gravitating substance that possibly makes up part of the missing mass of our universe may reside in parallel universes. Such matter would affect our universe’s gravity and is necessarily “dark” since our species of photon is stuck on our membrane (flat universe). Photons cannot travel across the void from the parallel matter to our eyes, though it may look normal to inhabitants of its own universe. Stephen Hawking invented quantum wormholes in 1988. Just as quantum mechanics says there is a certain probability that particles can appear from nowhere in a vacuum, quantum cosmology says there is a certain probability that a small chunk of space and time can suddenly pop into existence. A wormhole is a fluctuation in the space-time field, just as a virtual particle is a fluctuation in an energy field. The wormhole can connect to any of an endless number of preexisting parallel universes otherwise inaccessible to us. 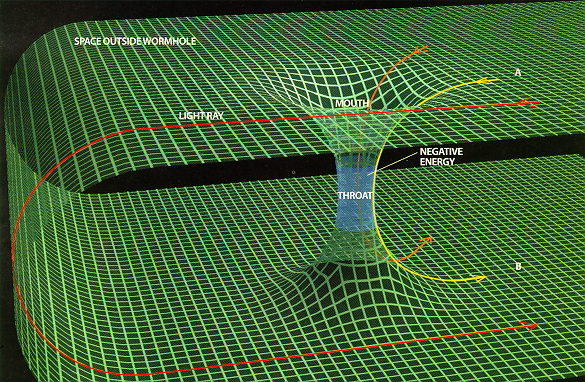 In 1989, Kip Thorne showed a region of space containing a negative mass-energy could stabilize wormholes. David Bohm’s notion of the holomovement includes an enfolded and manifest world, and a something-from-nothing philosophy. Is there one massive holographic field that actually exists in nature? Specific waveforms can be exact representations of spatiotemporal objects. Does the non-material implicate realm underlie our reality, an immense multidimensional wave function? Bohm also invokes the notion of the “pilot wave” in his interpretation claiming a quantum wave guides particles along their trajectories. Thomas E. Bearden is the darling of the ZPE (zero-point energy; vacuum potential) free-energy crowd. He is a stalwart defender of crosstalk with other dimensions, which interact with our own in extraordinary circumstances. He has concentrated on the properties of the vacuum as spacetime. He describes a hyperworld as a 3-space or 4-space rotated one or more orthogonal (90 degree) turns away from the ordinary world, constituting an entire subquantal level in a virtual state. What appears real in one parallel world is a virtuality in its 90 degree companions. In Excalibur Briefing, he uses his model as a theoretical framework for vacuum energy, mind, and matter. He describes the relation to hyperspace of the panoply of paranormal phenomena from UFOs and cattle mutilations, to the whole range of psi abilities, apparitions, and psychotronic weapons that add hyperdimensional aspects to their function. Moving beyond simple inflationary models, Andrei Linde of Stanford created a self-generating universe theory with complex elements. He calls it “the self-reproducing inflationary universe.” He views our universe as one of many sprouts of a growing fractal, sprouting inflationary domains that sprout more inflationary domains, each spreading and cooling into a new universe. According to this theory our universe came from a singularity. A universe can come from as little as an ounce of vacuum. Universes sprout into existence by the billions in dimensions we can’t see. Those with excessive gravity are crushed; with weak gravity no stars form. In an expanding bubble closed universe, inside is normal space, outside is energy super-saturated space of the initial conditions. Connections are possible only through wormholes. Maybe our universe is just a bubble in an endless chain of big bangs, bubbles within bubbles. Each new universe is a separate closed volume of space and time. Quantum fluctuations in inflationary expansion have a wavelike character. When these waves “freeze” atop one another, their effects are magnified. These stacked-up quantum waves disrupt scalar fields - the underlying field that determines the behavior of elementary particles. They exceed a sort of cosmic critical mass and start birthing new inflationary domains. Bubble universes are presumed approximately uniform. The laws of physics are the same in most of them. Multiverse has a common time for the primordial froth as a whole. Because of the infinity of universes, therefore stars and planets, Earth-like planets must exist in infinite number. That implies also infinite numbers of each of us. Right now an infinity of all humans exists in all possible variations. John Cramer describes a transactional theory where information passes backwards and forwards through time. Quantum handshakes between the future and the past create reality. Past emitters and future absorbers interlace past and future together. The non-linear collapse of these wave/particle complementary pairs creates a single world history, but past events are not causal. Greene and others have invoked string theory, suggesting that rather than particles, matter is the resonating tip of vibrating strings or tiny one-dimensional filaments curled up into virtual nothingness in 7 dimensions in addition to our three common dimensions of space plus time. In superstring theory we live in a nine-dimensional space. We notice three of them while the others remain curled up so tight they are unnoticeable. In Hyperspace, Michio Kaku describes the 10 dimensions of universe with string field theory. Strings have just one dimension, length. Fundamental objects in this theory are one-dimensional strings living in 10 dimensional spacetime. The vibrating string drives all subatomic particles. When they collide they create atoms and nuclei, jump-starting chemistry. String fans tend to be particle physicists. Fred Alan Wolf, (1988) also helps us speculate about all the wild ramifications and paradoxes of such views. In Parallel Universes he delves deep into the mysteries of the various theories. We live in a cloud of positional universes; the fog of time is parallel universes. “The key idea, the central core of all of the quantum paradoxes, is that possibilities -- universes conspire. It’s a quantum conspiracy,” among the infinite worlds. The whole world is connected through the existence of all these parallel universes. But many nuances have developed in the last 15 years since Wolf’s publication. New experiments and observations have been made. Both Michio Kaku (Parallel Worlds) and Sir Martin Rees (Multiverse) have new books on the multiverse coming out soon. Hermetic philosophers used an axiom attributed to Hermes Trismegistus as the basis of their metaphysical worldview. Their axiom, “As Above; So Below,” implied that what is true of the most exalted or superior realms of nature is also true of the most finite. They also believed in finer planes of consciousness: a plenum filled with hierarchies of supernatural beings, some far removed, and others close at hand. They spoke of a branching Tree of Life filled with primordial dynamics, and a spiritual field with four levels of force that permeates all. In their vision the universe of energy and matter emanated from the primordial state, impenetrable veils of negative existence, becoming progressively denser. They attributed existence to resonance and the transformations of Light and Sound. They recognized four primary elements, which we can correlate with the four fundamental forces: strong force, weak force, gravity, and electromagnetism. Even though superstition filled gaps in knowledge about the nature of these other worlds, in essence they are surprisingly close. Only in the last century has science been able to affirm these ancient intuitions. As man looked inside himself, he saw the basic essence of reality and struggled to describe it in common terms. Even in science, there is always a gap between reality and the descriptions of it. But the multiverse is not metaphysical (notions that cannot be proved or disproved), but quite scientific. It is studied in the fields of quantum cosmology and high energy physics. The normal laws of physics were “unborn” at the birth of this universe, because of the incredible density of energy. Some physicists speculate that compacting a mere ounce of matter could ignite a big bang that would create a universe we could never see. These ancient intuitive ideas are echoed in another scientific creation theory: In the beginning was the Void. Sound waves originated in the first instant of the universe’s life, when the cosmos underwent an extraordinary expansion. No one really knows what drove it, but by stretching the very fabric of space, it magnified a weird subatomic phenomenon - the spontaneous materialization of particles from a complete vacuum. Vacuum fluctuation underlies both cosmology and quantum processes. Vacuum-spawned particles flickering into existence from the void were energized by the Big Bang to remain in the real world. This sudden influx of countless particles from the vacuum was like throwing a stone into the dense particle pond of the early universe. It sent out ripples. These pressure waves rippling through the gas were nothing more than sound waves. The entire universe rang like a bell. The particle fog cleared and the universe became transparent. There was no longer enough pressure to support the sound waves. But now photons traveled freely through space, (“Let there be Light”). Before fading forever, those echoes of creation’s thunder left their mark on the cosmic microwave background. These sound waves compressed the particle soup in some regions of the cosmos and rarefied it in others. The resulting temperature patterns show the universe just as it was when the particle fog - and the sound waves - vanished. The first moments of cosmic history show the ambient energy was so great that the entire universe was in a false vacuum state. The energy of the false vacuum acts as a kind of antigravity, and caused space to balloon at an exponential rate. During inflation the universe was nearly empty, its energy content having been swallowed up into the false vacuum. Once it decayed to a classical vacuum, its excess energy precipitated like raindrops into the myriad hot particles of the Big Bang. The universe has never stopped inflating and is actually accelerating space and expanding the cosmos faster than we believed likely before 1998. When scientists look backward in deep time and try to look through the Big Bang, they cannot apply normal rules. Even the bizarre notions of quantum mechanics don’t apply, let alone the mechanistic rules of Newton. Some speculate that our universe came either from a void, or a white hole -- a singularity (Hawking). Others suggest it is the result of the collision of two bubble universes in a frothing stew of similar self-contained bubbles (Linde). Still others contend it comes from a non-material realm of pure information (Siegfried). Bohm’s implicate order is actually a quantum fuzz or superdense quantum vacuum. We know the Big Bang happened because the universe is still expanding, even accelerating (Goldsmith). Physical reality is not absolute. Materialism is as dead as communism. Science has tried to find the fundamental building blocks of matter, but has been stymied. It simply depends on the assumptions and theory you use with the level of observation: cosmological, molecular, atomic or subatomic. Now the quark (theoretically point-sized), long thought the smallest unit discernable, is giving way to finer distinctions - a whole new level of the makeup of matter. Creation may come from nothingness (ex nihilo), but it doesn’t travel very far from it when closely examined. It only and ever manifests as quantum potentiality, though it appears particle-like. This includes both the so-called organic and inorganic matter. The universe is more like a dream than concrete. In fact, there is no such thing as solid matter at all, no hordes of tiny particles. All manifestations are reduced to probability waves in quantum mechanics. We have suggested elsewhere (see “Helix to Hologram”) that the so-called material world is a projection of a frequency domain, fields within fields, tuned with resonance, light and sound. This holographic concept of reality requires the unperceived information background as its basis. Both particle and field exist only in the implicate order. Light is even more ephemeral. The most theories provide is the best explanation. Explanation not prediction is the point of science. We explain the world in terms of embedded hierarchies of substructures and superstructures. Each appears as a thing in itself with specialized functions and dynamics. Physics determines what can be computed, including the information capabilities of matter and energy underlying physical dynamics and deeper sub-quantal levels. Reality consists of continually diverging and converging waves unfolding from the information level, but that is another story, as is the physics of consciousness. The mind arises from the laws of matter. While some scientists are trying to describe matter as consciousness others are trying to reduce consciousness to matter. A thought of a thing is not that thing, but it is not nothing either. Our thoughts about the ultimate nature of reality affect that reality at the metaphysical level. As intuitive Jorge Luis Borges said, “Time forks perpetually toward innumerable futures.” All that can happen, must happen. The outdated notion of our universe is an idea, not a reality. As an idea it has been proven obsolete. Bearden, Thomas (1988); Excalibur Briefing; San Francisco: Strawberry Hill Press. Borges, Jorge Luis (1941), “The Garden of the Forking Paths” in The Garden of the Forking Paths. Deutsch, David (1997); Fabric of Reality; London: Penguin. Edelman, Gerald M. and Giulio Tononi (2000); A Universe of Consciousness: How Matter Becomes Imagination; New York: Basic Books. Gell-Mann, Murray (1994); The Quark and the Jaguar; New York: W. H. Freeman and Company. Goldsmith, Donald (2000); The Runaway Universe; Cambridge, Massachusetts: Perseus Books. Greene, Brian (1999); The Elegant Universe; New York: W. W. Norton & Company. Hawking, Stephen (1988); A Brief History of Time; N.Y.: Bantam. Kaku, Michio (1994); Hyperspace; N.Y.: Anchor/Doubleday. Kaku, Michio (2003); “Parallel universes, the Matrix, and superintelligence”; KurzweilAI.net, June 26, 2003. Lemly, Brad (2000); “Why is there life?” Discover, Vol 21, No.11, Nov. 2000. Overbye, Dennis (2002); “The universe: Is ours one of many?” New York Times, Oct. 31, 2002. Pickover, Clifford (19); Surfing through Hyperspace; Oxford University Press. Rees, Martin (2000); Just Six Numbers; New York: Basic Books. Rees, Martin (2001); Our Cosmic Habitat; Princeton, N.J.: Princeton University Press. Satinover, Jeffrey (2001); The Quantum Brain; New York: John Wiley & Sons, Inc.
Siegfried, Tom (2000); The Bit and the Pendulum; New York: John Wiley & Sons, Inc.
Smolin, Lee (1997); The Life of the Cosmos; London: Weidenfeld & Nicolson. Tegmark, Max (2003); “Parallel Universes”, SciAm, Vol. 288, Number 5, May 2003, pp. 40-51. Thuan, Trinh Xuan (2001); Chaos and Harmony; N.Y.: Oxford University Press. Wolf, Fred Alan (1988); Parallel Universes, New York: Simon & Schuster. Wolf, Fred Alan (2000); Mind Into Matter; Portsmouth, New Hampshire: Moment Point Press.